Deliveroo vs Uber Eats. The ultimate battle. Which has better pay? better conditions? better shifts? Read this article to find out which company to sign up for. This really depends on the area you’re working in. If you’re in a really quiet area then Deliveroo is definitely the go to because of their pay per hour scheme. This means that even if you get no orders during a shift (which has happened to me loads of times), you’ll still be getting paid. The startup fee is also lower for Uber cyclists. Uber charges £30 for their delivery bag (which is the only requirement for working), whereas Deliveroo now charges you £100 for the box, jacket and thermal bag (all of which are requirements for working). At the moment I think that Uber is only available in London and surrounding areas, which does limit it as an option to riders, but it should be expanding to other areas in the country. Support wise, I personally think Uber is better. The email support is much quicker (I would say only a third of my emails to Deliveroo even get a reply), but Deliveroo does have a well-delivered phone support. The app experience is better for Deliveroo. The Uber directions can often lead you to the completely wrong location. Furthermore, Uber does not see the difference between cyclists and moped couriers, and so I have been directed onto a dual carriageway before during a delivery for Uber Eats. So far Uber sounds like the best, but the problem is you have to have the orders coming in the first place to make the most out of it as a rider. Even though Uber might pay more per drop, you will probably get fewer drops per hour on average than Deliveroo. 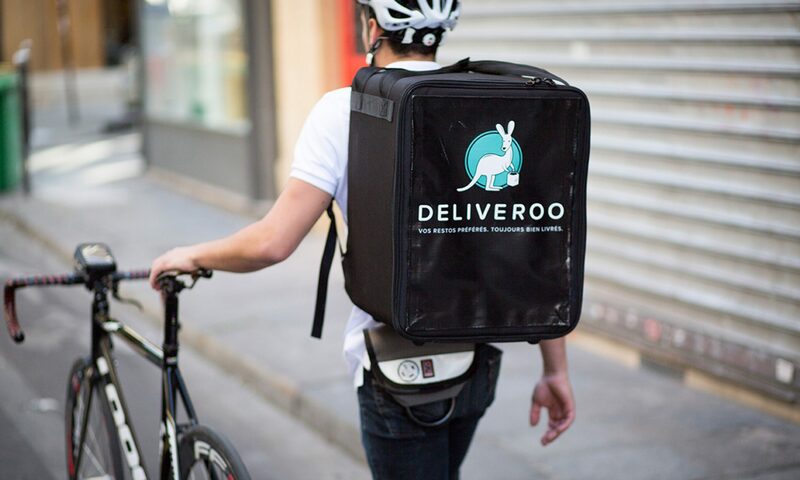 This means that you’ll actually have a higher hourly rate working for Deliveroo. This might change as Uber Eats gets more popular, but currently, it leaves the choice between the two companies as a very hard one for future couriers. After you have scheduled a Deliveroo interview, Deliveroo will send you a message with the details of everything you need to bring for the interview. This includes a passport, ID, smartphone, kit (if you want to use your own) and a credit card (if you want to buy the kit). They call it an “interview” but it’s really not. All they do is check your documents and talk you through the app. I don’t think it’s actually possible to fail it. You also need to order all of the gear from them (for a ridiculous price) and then you can get on the road and start earning money! The office where you have an interview is usually really hard to find. For mine, I had to walk through an estate agents office and then down some stairs to the basement. In the basement were loads of computers and deliveroo boxes stacked high around the desks. The whole process takes about an hour or so. You start by showing your passport and then they send you a link to download the app and sign up. You also need to choose the are you would like to work in. They’re pretty sneaky about this because when you sign up they make it seem like you can work anywhere you like, but a lot of the places are already full. I wasn’t able to work in my neighborhood and so I had to sign up for the next door one which was a bit of a pain. You also get to select the shifts you want to do. I would recommend selecting every single shift at first and then just missing the ones you can’t do. It’s so much easier to get rid of shifts than it is to get new ones, and Deliveroo is super chill about you not turning up to shifts every now and again. You’ll then have to sign are few forms (all done on your phone) and buy the equipment. Make sure you ask for lights and a helmet as well because they give those out for free! This is easy-peasy. All you have to do is signup through this link here (my special referral link), and you’ll be given a £50 bonus once you complete 20 orders (which you can do in a day). That’s it! First you need to visit the application page by clicking this link. Then you need to fill out all of your details in the system. You will then go through the on boarding process, where you watch all of the videos own safety and how the whole system works. This is very easy and only takes a few minutes. You then need to complete the background check. Here you will need ID (a passport) and a proof of address (utility bill or bank statement). Once this is complete, you can go through to the next step which is booking an interview. The interview is pretty much just them talking you through the system and organising your work. It’s easy and you don’t have to answer any questions. Once this is done, you can collect your kit and get on the road! The Deliveroo application is really easy and only takes a few minutes. After that, you will need to go for the interview where you collect all your gear and get talked through the app. Deliveroo was probably the easiest job I’ve ever had to sign up for. There are no hard interview questions, long waits or competition. I don’t think anyone has ever failed an application to become a Deliveroo rider. Deliveroo used to have a cycling proficient session where you would cycle around your city with an instructor, and they would check whether you could ride a bike safely. I think a few people did use to fail this. The problem was this whole process just took way too much time and money, and Deliveroo needed riders on the road as quickly as possible. By moving to an online system, they can “educate” all of the riders before they even meet them, and get them out cycling on the road within an hour interview!